I had insomnia the night of the second presidential debate between Hillary Clinton and Donald Trump. 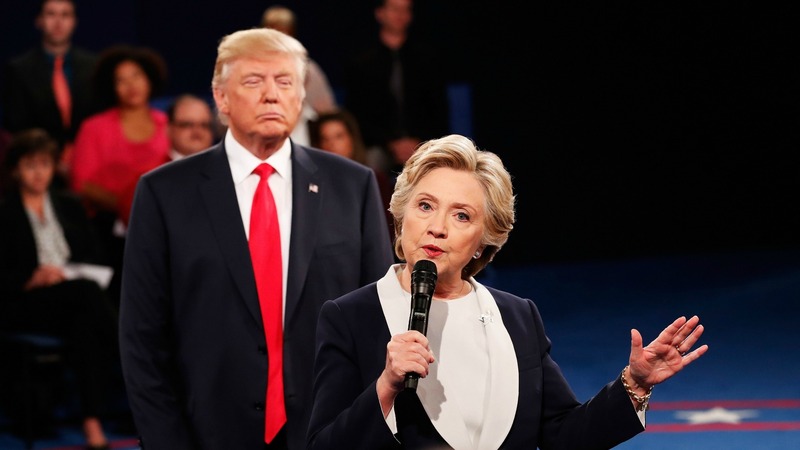 Something about the now-infamous Billy Bush bus recordings and the menacing way Trump hovered over Clinton, the “you’d be in prison” snarl, his aggressive personal attacks. I couldn’t even stand to watch the entire debate, and still it sent a toxic cocktail of emotions that kept my mind racing all through the night. The next morning, I was surprised to find just about every women I talked to had the same night. Anakwah fears the toxic climate created by the Trump campaign won’t dissipate once the election season is over. Manhattan therapist Dr. Cynthia Grace has seen election anxiety in some of her patients, and feels a lot of it comes from a new sense of vulnerability. “I think a layer of something has been removed for a lot of people, women in particular” she tells SheKnows. “And that is a sense of protection.” Coming after a summer of police shootings, the election has made people of color feel as if there’s no end in sight. One patient told Grace she was tearful after watching the debate, saying that “now she feels that there’s no possibility of getting any protection in society.” She perceives an aggression that’s been unleashed in society at large, a sense of how many people “just don’t value women and are likely to be very toxic and harmful to women.” It feels like this election has made the world a more dangerous place for women. Even Michelle Obama admitted in her recent speech that Trump’s words and history had “shaken me to my core in a way that I couldn’t have predicted.” In a way she shouldn’t have predicted — I think we’ve all been blindsided by the toxicity of this season. Every election is stressful. The American Psychological Association even has tips for coping with our Election Stress Disorder. But I think there’s been an anxiety particular to women, especially women of color, this time around. So how do we cope with these last few weeks of the election and whatever backlash follows its results? SheKnows spoke with Grace and with therapist Dr. Laurie Moore for their suggestions for managing election anxiety. Self-care is “extremely important” right now, Grace told SheKnows. “What we need to do right now is shore up our support.” She recommends doing yoga, meditation and getting a massage if you can. If you’re not already doing yoga or meditation, now is an excellent time to start. Grace recommends meditation apps like Calm or Oprah and Deepak Chopra’s Meditation Experience. Grace recommends spending time in places that feel safe talking with like-minded people who can affirm your feelings and help you make sense of what’s going on. Like many mental health professionals, Grace says we should limit our exposure to triggering videos. “There’s one thing I can tell you as a psychologist,” Grace says, “the brain sometimes does not know the difference between something happening in reality and something we’re being exposed to through the media. So especially if you’re a woman with an abuse history, don’t watch videos of Trump saying hurtful things about women and people of color. Don’t watch footage of his rallies. Limit your exposure to material that raises memories of your own toxic experiences. It’s not helpful. I’m a chronic worrier, so I’ve been reading Robert Leahy’s book The Worry Cure. One of his suggestions for cutting off that worst-case-scenario projecting into the future we often do is to take some small action, something you can do today. So if you find yourself stressing over our impending apocalypse, stop and make a donation to your candidate or volunteer for your candidate or find something you can do today to make your world a better place, however small. Help someone carry their groceries in, anything. It’s my hope that as we do the work to build our resilience at this time, we’ll find the collective power to rise and rebuild a better world together in the years to come. More: Nasty women of the world, unite!